FOXWEDGE (AUS) (Bay 2008-Stud 2012). 5 wins-2 at 2-to 1200m, MVRC William Reid S., Gr.1. Brother to SW She's a Fox. Sire of 156 rnrs, 57 wnrs, inc. SW Volpe Veloce (ARC Eight Carat Classic, Gr.2), Foxplay, Kentucky Miss, SP King of Spades, Seafront, Star Empire, Urban Fox, Aghna, African Rainbow, Petition and of Colosimo, Roy's Magic, Volpino, Albumin, Elliptical, Juan Horsepower, Melissa Jane, A Mist Opportunity, Arizona Wildcat, Barjeel, etc. His oldest progeny are 3YOs. IMPETUOUS (f. by Fastnet Rock). 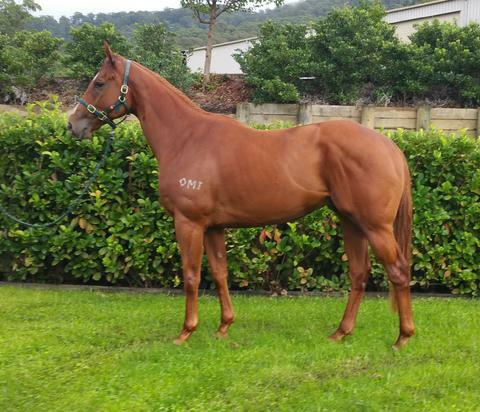 3 wins at 1350m, A$124,950, Wyong RC Mona Lisa S., L, 4th Scone RC Inglis Guineas, L.
Volpe (g. by Foxwedge). See below. DEMERGER (Saithor). 8 wins-2 at 2-from 1400m to 3200m, A$997,250, SAJC Adelaide Cup, Gr.1, VRC Matriarch S., Gr.3, Queen's Cup, Gr.3, Bounty Hawk H., Dover P., Scomeld H., MRC April 2YO H., Highways Tabaret 2YO H., 2d Moonee Valley Oaks, Gr.2, SAJC Carlton Draught S., Gr.3, VRC Beachside H., MRC Wood Court Inn H., 3d MRC Angus Armanasco S., Gr.2, VRC Let's Elope S., L, Ballarat Cup, L, VRC RSL H., 4th AJC Australian Oaks, Gr.1, VRC AV Kewney S., Gr.2, Rose of Kingston S., Gr.3. Producer. MAJESTICALLY (Maroof). 10 wins-2 at 2-from 1100m to 2400m, A$677,593, AJC Summer Cup, Gr.3, STC Stayers' Cup, L, Frank Underwood Cup, L, Lord Mayor's Cup, L, AJC De Bortoli Wines H., STC Star City Welter H., Illawarra TC Kembla Grange Cup, AJC Hershey's Cookies 'n' Creme P., STC Romeo Cellars Smithfield H., Wong 2YO H., 2d STC Todman Slipper Trial S., Gr.2, NE Manion Cup, Gr.3, Clarence River JC Grafton Cup, Gr.3, AJC Australia Day Cup, L, STC Stayers' Cup, L, WJ McKell Cup, L-twice, Christmas Cup, L, Murrumbidgee TC Wagga Gold Cup, L, 3d STC Winter Cup, L.
Race Record: 5 Starts 0-1-1 A$11,550.